Hanoi (VNA) - Vice President Dang Thi Ngoc Thinh, who is also Chairwoman of the National Fund for Vietnamese Children (NFVC) Sponsorship Council, hosted a reception for President of Operation Smile Kathy Magee in Hanoi on April 1. The Vietnamese leader thanked Operation Smile for its valuable contributions to disabled children in Vietnam during the last three decades. The organisation’s surgery support programmes have brought smiles to and changed the life of hundreds of thousands of children with disabilities in Vietnam and all over the world, she said. Since 1989, the organisaiton has conducted many support progammes on craniofacial, cleft palate, and facial defect surgeries, and treatment for burns in Vietnam, helping a great number of Vietnamese children integrate into the community. It has also trained medical staff of Vietnam, Thinh added. 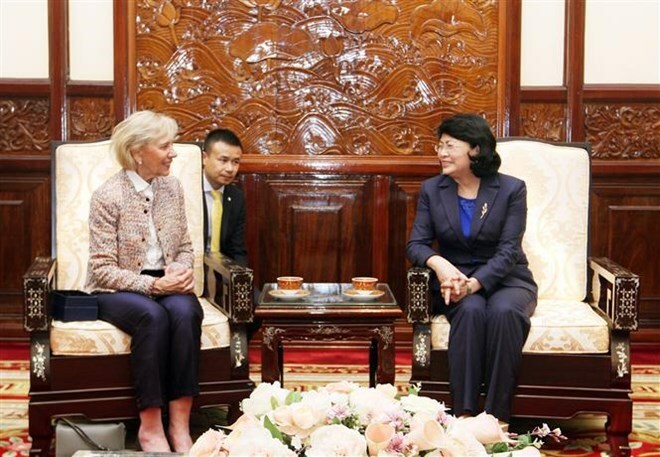 She affirmed that Vietnam will actively coordinate with, and create favourable conditions for Operation Smile to bring more happiness and smiles to children with birth defects across the country, expressing her hope that the organisation will provide comprehensive treatment programmes for children, and develop phonetic therapy projects for children after cleft palate surgeries. Magee thanked the Vietnamese side’s support and cooperation over the years, saying that she hopes the two sides will continue effectively work to benefit more Vietnamese children.